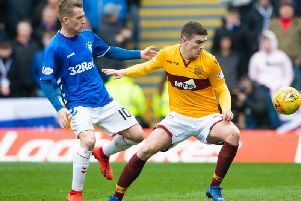 Rangers winger Ryan Kent has been charged by the Scottish FA with violent conduct after lashing out at Celtic captain Scott Brown during Sunday’s Old Firm clash. Kent appeared to strike Brown, knocking him to the ground, as he went to retrieve the ball from the Hoops skipper after James Forrest scored a late winner for Celtic. The on-loan Liverpool attacker has been offered a two-match ban, with a fast-track hearing set for Thursday April 4. Referee Bobby Madden missed the incident, and Kent escaped punishment during the match. However, he could now miss two matches if found guilty by a judicial panel. His Ibrox team-mates Andy Halliday and Alfredo Morelos were sent off as Rangers lost the match 2-1.